This weekend saw the Palm Big Paddle. A celebration of thirty years of Palm gear. The weekend was based on the River Wye at Symonds Yat, with camping, entertainment, competitions, guided paddles, a shuttle bus service, demo boats and much more! Team AS watersports dropped in to see what was going on. Mitch and his family enjoyed a guided trip down the River from Kerne bridge. Mitch also built a super streamlined Cardboard canoe for a cardboard canoe race! Jim and Louise dropped in for Saturday nights entertainment, Live music and DJ's rocked the Big top till the small hours! Then Sunday saw some paddling action. Jim paddling his squirt boat whilst Louise took on the Mighty 'Yat Rapids' in her Canoe. What an excellent weekend the Big Paddle was! I think its appropriate to say thank you for the 30 years that Andy Knight has dedicated to paddlesports. The effort that Andy and his team at Palm Equipment have put into making a wide range of excellent products that makes our sport so much more enjoyable and fun. The Big Paddle 30 year celebration weekend proved just how much fun it is. Thank you to Andy Knight, Bob Slee and all the Palm team. 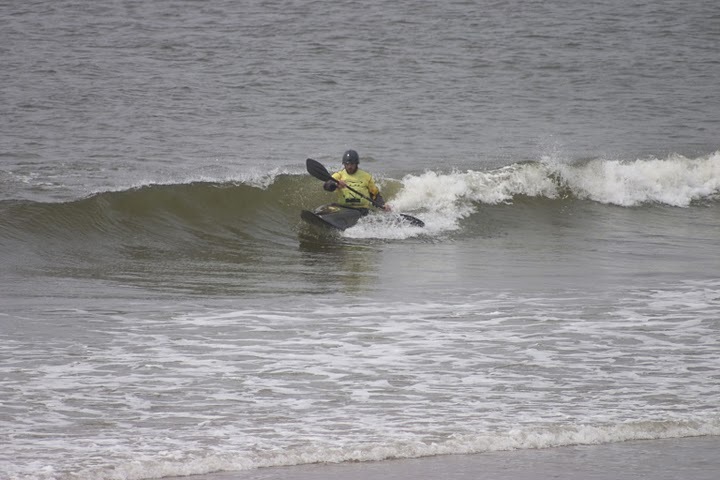 AS Watersports surf fan Jim has been out in the water recently. 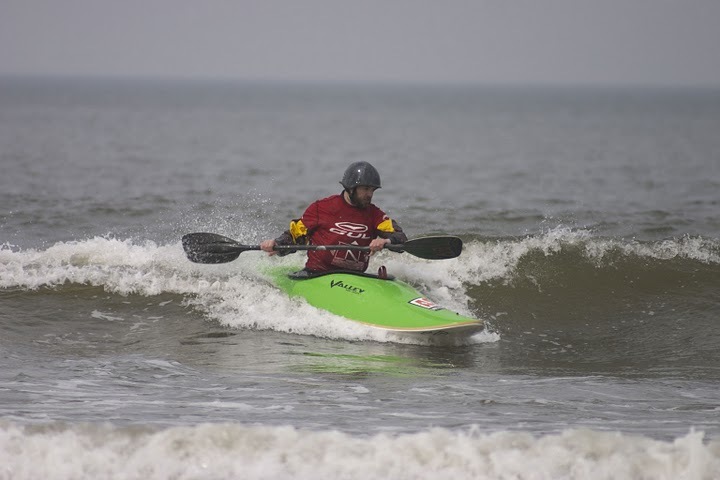 Here are a quick couple of pictures taken while Jim was competeing at the recent Shoreline handicap competition at Blackrock Bude. Tiny waves breaking on the shoreline, but fun! The Surf was tiny, when the tide came in it was breaking in barely a foot of water, and most people were finishing their rides on the sand! 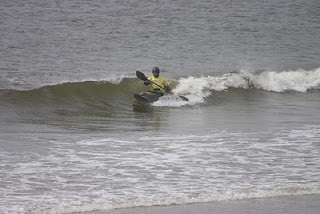 Jim was paddling his trusty Valley Rush 7'2", but also took the Valley Rip of for a quick spin in the small conditions. Jim got a first and two seconds in the heats to end up joint 11 at the end of the day. Thanks to Denzil for the pictures!